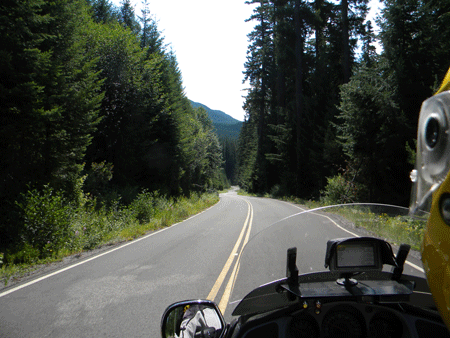 Ride 6- This time we are headed east of the Cascade Mountains in mid-June. We are going to take the scenic route over the mountains and though some valleys to the wine and fruit region. The day starts out with some scattered showers but the temperature is comfortable and the ride easy. 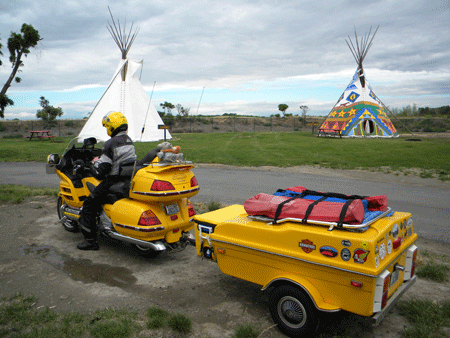 We arrive at the campground of the Yakima Indian Reservation. We find out at check in that no alcohol is allowed in the reservation! That won't do! 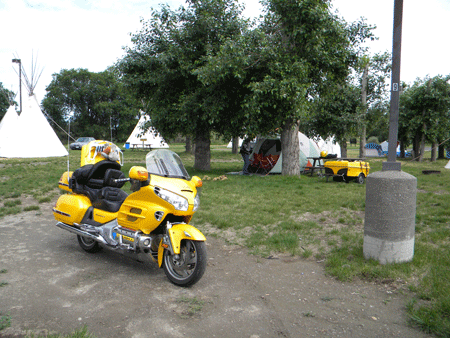 But as we have not checked out whether there is any other campground in the vicinity we decide to stay. We will pour the beer into a mug and drink it anyway. We have no intention of getting drunk and causing a problem. Nor do we plan to share it with any other campers. We make camp in the shade of couple of topped Cottonwood trees and make ourselves comfortable. After an hour Kathy can't resist and we go over to the casino. I go along although I don't have any plans to gamble. I figure I'll have a beer in the bar. But there is NO BAR!! The only casinos I have been in were in Nevada and all had lots of bars. In fact drinks for active gamblers are free. Not here! I tell Kathy I'm leaving and as it is less than a mile to camp she agrees to walk when she has spent her $20. She is a conservative gambler and never gets carried away with her gambling. I just see no entertainment value in giving my money to them, so I don't. 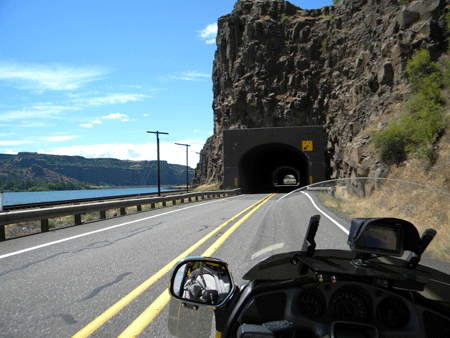 On the return trip we head south to the Columbia River Gorge and follow the 2-lane highway along the north shore. The ancient lava flows that formed much of Washington and Oregon are cut deeply by the Columbia River making it difficult to build 2 railroads, a highway and a freeway through it. But this does make for scenic views and tunnels. 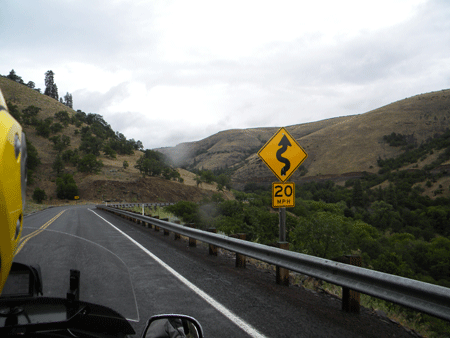 Ride 7- On this ride in mid-July we are going to the "Cowboy Dinner Tree" with the GWRRA (GoldWing Road Riders Association) chapter from Salem, Oregon (GWRRA OR-G). We are not following the same route because they are closer but we will all camp together. 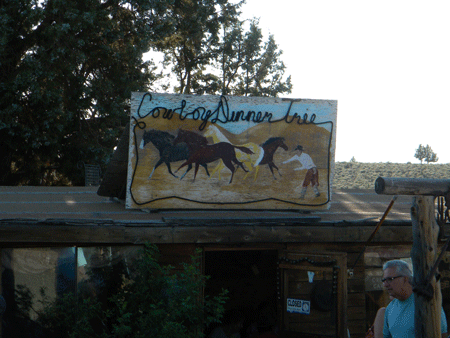 The Cowboy Dinner Tree is a steak house in the middle of nowhere near Silver Lake, OR. When this was cattle country the chuck wagon would usually park here by a large Juniper tree, hence the name. 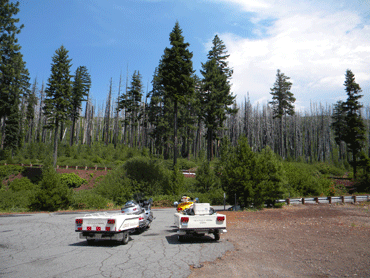 I heard about it in 2005 when I worked fighting forest fires for the USFS office in Silver Lake. It is only open weekends and can be snowed in in the winter. It only serves two meals, a 30 oz. (almost a kilo) steak or a whole chicken, and there is no sharing meals. When I heard that OR-G was planning to go I quickly signed up. 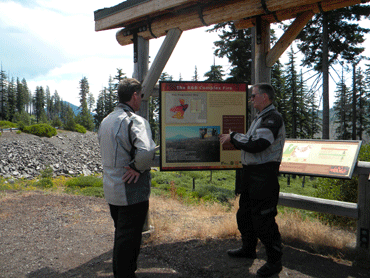 We took the scenic route, of course, over the Oregon Cascade Mountains to the High Desert region of Central Oregon. After giving a lot of thought to next year (2014) and our long term trip we decided to buy a tent trailer instead of trying to camp all the time in a tent. We again rode with Mark who also has a Leesure-Lite trailer.